Heave a sigh all you weary people of God! Advent is the first moment of the new liturgical year, and it is a time to cast aside the worries of the world and to focus on what really matters – our eternal life! Luke records a very bleak and scary image of the end times, in which “people will die of fright in anticipation of what is coming upon the world.” This isn’t the peace we are longing for as we sing about sleigh bells and anticipate cozy night by the fire! But we are told in the same breath by Jesus to stand erect and raise our heads, because our redemption is at hand. Jesus said to his disciples; “There will be signs in the sun, the moon, and the stars, and on earth nations will be in dismay, perplexed by the roaring of the sea and the waves. People will die of fright in anticipation of what is coming upon the world, for the powers of the heavens will be shaken. And then they will see the Son of Man coming in a cloud with power and great glory. But when these signs begin to happen, stand erect and raise your heads because your redemption is at hand. If you enter a Catholic church or home during the four weeks leading up to Christmas, you are likely to find an Advent wreath of greens and berries adorned with three purple candles and one rose candle displayed prominently in a central location where the family gathers. Our family places the Advent wreath at the center of our dining room table, so that we can incorporate its prayers and songs into our dinner prayers and enjoy its glow as we eat our meals. As you have probably guessed, this tradition of the Advent wreath goes far beyond festive decoration. In fact, it has been used as a teaching tool for centuries, in order to catechize children and actively prepare and participate in the coming of Christ. At the center of the home during the season of Advent there is anticipation, waiting, decorating, singing, and preparation. This (should) all be for the coming of the long-awaited Christ child. Beyond the hoards and hoards of sugar glazed cookies and strained bank accounts, Advent is a time of preparation. Our hope mounts until it is met with its greatest joy! Children wait to place the baby Jesus in his manger in the nativity scene, they wait to pull back the last window of the Advent calendar, and they wait to light the final candle of the Advent wreath. These wonderfully symbolic traditions help in preparing our hearts for Christmas. They are visible signs of the spiritual movement taking place around us. The exact history of the Advent wreath is unknown, although pre-Christian traditions often lit such wreaths during the dark months of winter in anticipation of Spring. Christians adopted this tradition by the Middle Ages, giving it a Christocentric meaning in anticipation of Christmas. By the 1600’s both Catholics and Lutherans had developed more formalized practices and prayers associated with the Advent wreath. The use of evergreens as well as the circular crown shape of the wreath has traditionally symbolized eternal life and the infinite nature of God. The four weeks of Advent leading up to the Christmas celebration are symbolized by four candles – one to be lit each of the four weeks. The first, second, and fourth weeks of Advent are represented by purple candles; this color symbolizes the prayer, penance, good works, and preparatory sacrifices the soul makes in readying itself for Christmas. The third week of Advent is called “Gaudete” Sunday and is represented by a rose candle. Gaudete Sunday symbolizes joy and is set apart from the other weeks in a particular way to commemorate the joy of being halfway through the waiting and preparation period. It is a time of rejoicing in the midst of the focus on penitential preparation. I love this week, perhaps because it shows the goodness of Christ in the midst of our suffering and human condition. It reminds me that we are loved and understood by our Creator, and that He reaches down to comfort us in the moments when we are working out our salvation with fear and trembling. 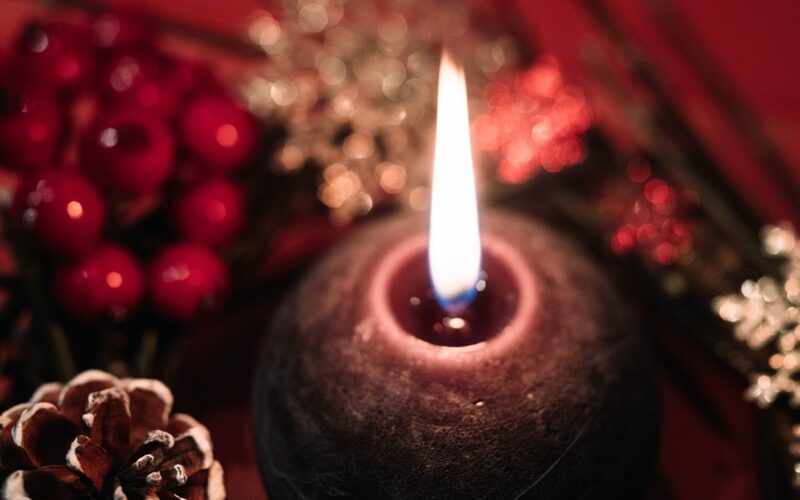 A white candle is often placed in the center of the Advent wreath, which is lit on Christmas and symbolizes Christ, “the light come into the world.” His light outshines all of the other lights – which are worn down and melted. The one central white light draws our eye into the heart of the wreath and alas, we breath that much-needed sigh of relief that Christ has come! Advent prayers accompany the lighting of each candle in the wreath, and often the haunting refrain of “Oh Come, Oh Come, Emmanuel” echos through the home, reminding us of the call of our ancestors in faith; the Israelites, who cried out to their God for ransom from their captivity. We also cry out for ransom from our captivity from sin – the ransom, we know has already been paid, but the acceptance and personal conformation and renewal must be ongoing. Thus, the Advent prays transport the Christian in a special way to the biblical times of our ancestors. Response (R/.) Who made heaven and earth. R/. Thanks be to God. he is the Savior of every nation. as we light the candles of this wreath. be a sign of Christ’s promise to bring us salvation. and be thyself our Prince of peace. The CGS Advent Song – Light One Candle is a simple way to teach and remember the meaning of each of the four weeks of Advent. Everything seems to glow dimly during the season of Advent; from the calm flicker of the Advent candle flames to the lights on the Christmas tree in the darkened family room. It is a time of peaceful mourning, and a reminder that we must prepare for our own death (memento mori – reflection on mortality). Advent is time taken out from our busy days to focus on Christ alone and to assess the current state of our soul – and its readiness for eternity. All I hear when I read this verse from Luke is “beware that your hearts do not become drowsy from the anxieties of daily life.” I’m not phased by the carousing and drunkenness, but anxieties of daily life – yikes! Everyone will face that reckoning day – everyone on the face of the earth! If Advent offers nothing else, it’s certainly a time to face those pesky anxieties of everyday life – you know, the ones that really bear no weight whatsoever in the grand scheme of things, and yet have the ability and power to take over our time and half of our daily brain power. One of the best ways to achieve both the needed vigilance and the reduction of anxiety, is to turn more faithfully to scripture and to reflect regularly upon it. When our family chose an Advent wreath, we decided to incorporate as much scripture into the practice as possible. We found a pewter pictorial wreath that follows the tradition of the Jessie Tree, which systematically follows the biblical events leading up to the birth of Christ. The Jesse Tree is named after Jesse, who was the father of King David and is therefore the “root” in the genealogy of Christ’s lineage. The Jesse Tree starts with the creation in Genesis and follows salvation history all the way until the birth of our Lord. It is an excellent way to easily review the events of the Old Testament, leading into the New Testament, with pictures and symbols and short verses from scripture. The connection of Jesse to Christ is reflected through religious art and the stained glass of cathedrals! The Jesse Tree helps to familiarize our family with the names of the prophets and some of the significant events surrounding their moment in salvation history. Artist Girolamo Genga painted an image of Jesse reclining at the base of a tree “which issues from his loins.” The ancestors of Christ are counted among the branches of the tree until the culmination of the virgin Mary and the Christ-child at the top of the tree. 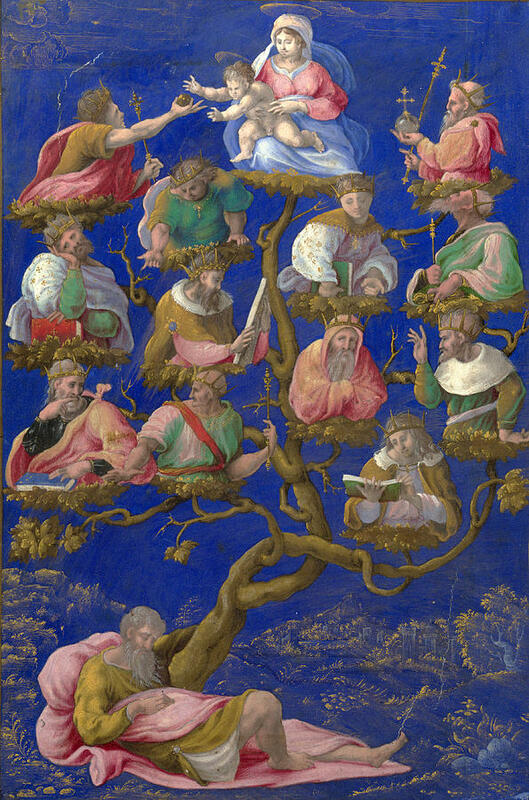 This genealogical tree served as a visual representation of the lineage of Christ from Jesse. 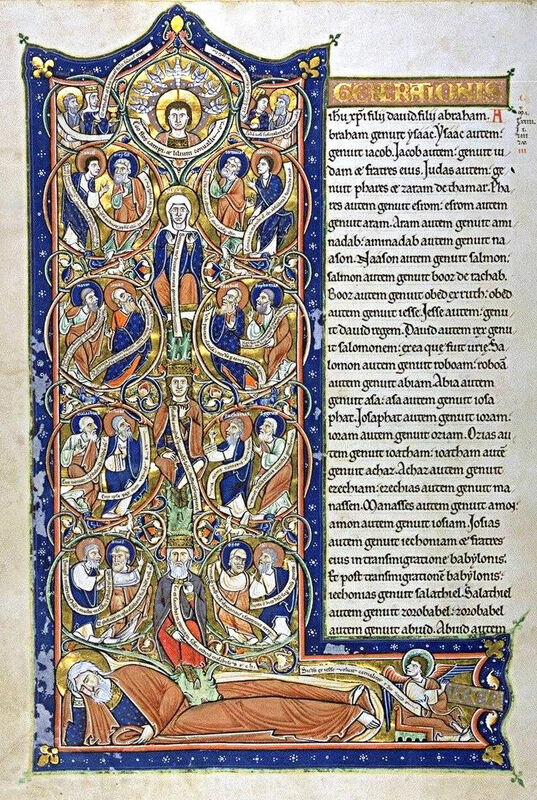 The Jesse Tree appears earlier in several Romanesque Bibles, usually as a large historiated initial at the start of a biblical book. The Saint-Bénigne Bible is perhaps the earliest appearance, and The Capuchin’s Bible (c. 1180) shows a Jesse Tree forming the L of Liber generationis at the start of the Gospel of Mathew. 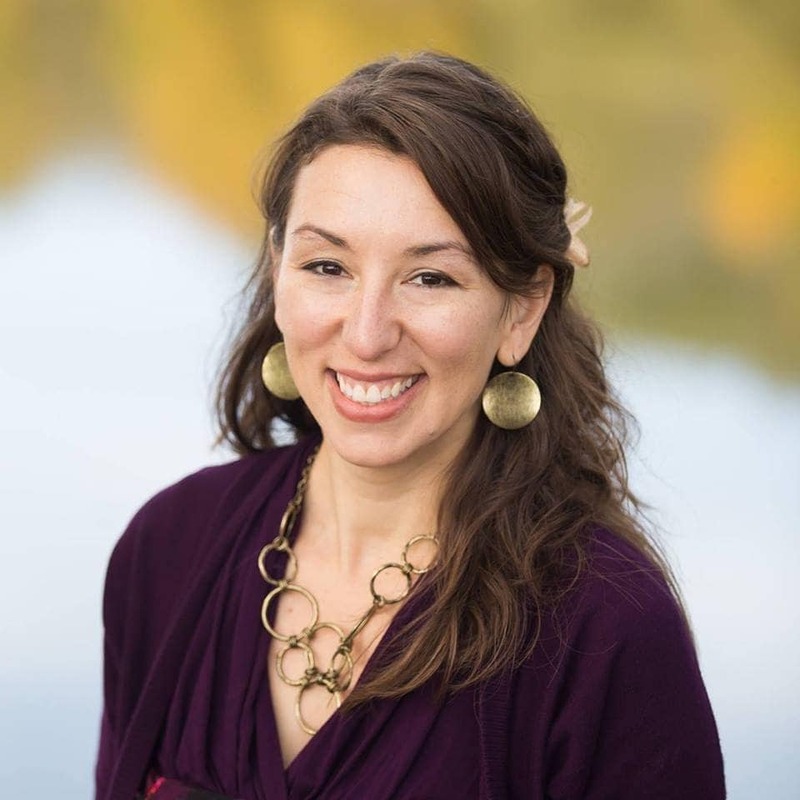 Advent images, songs, and stories begin to connect us more fully to one another and our scriptural roots in Christ. As we enjoy our festive homes, bustling with traditions and tunes recalling biblical scenes, it’s no wonder that even the most distant heart begins to long for something more than the anxieties of daily life. Tis’ the season when not only Lifetime and Hallmark get into the heart-warming, do-good, abundance of angels show-boating. Those age-old classic Christmas songs and movies still grace our hearths, as we strive to instill the magic they seem to bring into our own children’s hearts. Yes, perhaps the most beautiful thing about Advent is the “bringing back.” We hope for ourselves and those we love that even the most distant and fallen-away soul might find the same sensation of longing…and find their way back to Christ at Christmas!